Featured Stories | His Kids Too! "Walter Steely has a heart for helping others and he is spending his life doing just that. "The His Kids Too! Summer Bible Camp held in Dzerzhinsk, Ukraine, June 23-28 was a smashing success. More than 41 volunteers came from all over the U.S. and Ukraine to serve orphans and local children. More than 1,000 orphans in Ukraine received a very special surprise this winter as local charity His Kids Too! delivered Christmas gifts and gave holiday parties to nine orphanages. Tallahassean Rich Fillmon , co-founder of His Kids Too!, along with two volunteers from Jacksonville, Texas …..
ENCINITAS – Nearly her entire head was swathed in bandages from her sixth surgery in 2½ years, but a drowsy Natasha Ivanishcheva was upbeat. She was born in the Ukraine with Treacher Collins syndrome, a genetic birth defect that distorted her skull, ear and face. She was abandoned by her parents and treated like a freak when she ventured out in public. June and July were busy months for Tallahassee based charity, His Kids, Too! Arriving in Dzerzhinsk Ukraine on the 27th of June, we were busy making the final preparations for the summer Bible camp. Our daily average was 125 children, and 38 team members from the U. S. and throughout Ukraine. The final week, July 9-13 was spent delivering thousands of lbs. 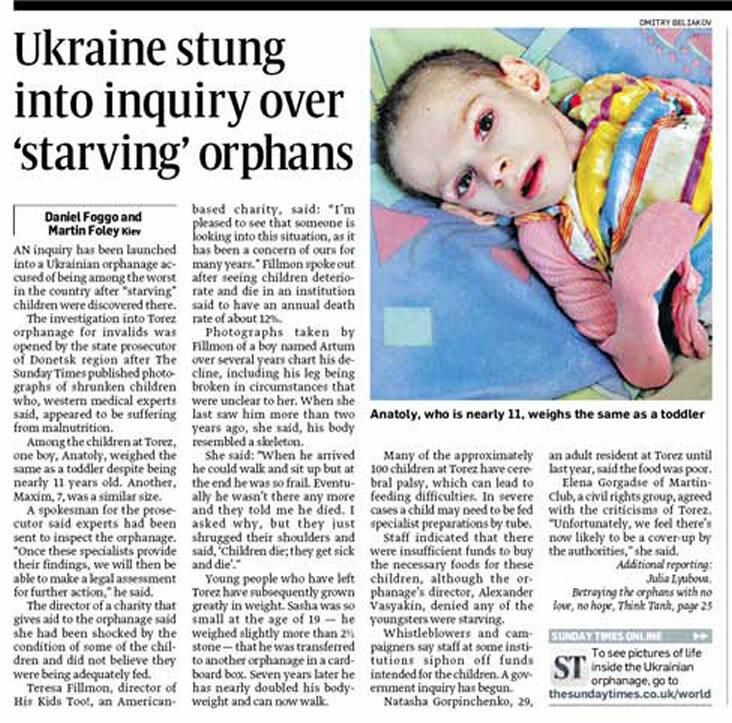 of humanitarian aid throughout the Donetsk region to over 5000 orphan children. When our group left for Ukraine a few weeks ago, I was excited and nervous about the two weeks ahead of me. The nine of us were headed to Dzerzhinsk, a small town in rural Ukraine, to help with a community Bible school and to distribute humanitarian aid. Though I'm not the most well-traveled teenager, I thought I had prepared myself, having studied travel guides, practiced reading the Ukrainian alphabet, and packed every travel-sized toiletry know to man. None of this, however, prepared me for the emotional and spiritual journey ahead. By the time the Bible school began on Monday morning, I was overwhelmed, exhausted, and worried about what I'd gotten myself into. I didn't know how I could relate with the children when I couldn't even talk with them. My worries were quickly relieved, though, by the children's warm smiles and anxious laughter. As my class sang "Jesus Loves the Little Children," both in Russian and in English, it struck me that though language is not universal, God's love is. I didn't have to read the Russian Bible to my class to minister to the children. Simply holding hands, singing songs, and making crafts with them was enough to show that we cared. Each of us showed God's love in some way that week: playing basketball, teaching a game, or leading a silly song. I'm so grateful to our church and His Kids, Too! for the opportunity to have been able to reach out to the children of Dzerzhinsk in this memorable way. It started as an idea. Theresa and Maureen McKenna were learning how to sharpen their skills during a medical mission trip in the Dominican Republic three years ago. They couldn't help but notice people, especially women, who walked for miles barefoot. Many of the villagers' injuries could be avoided if they had a pair of shoes. The 26-year-old twins, who are medical students at Florida State University, launched the "Share a Pair" drive to help provide shoes for people living in poverty-stricken areas of the world, such as Africa, the Dominican Republic and Haiti. Since the Tallahassee Democrat reported the story in November, they've collected more than 2,000 pairs. They recently went to Haiti and left behind four suitcases full of shoes. "We anticipated that people would participate, but the response has been phenomenal," McKenna said. The donations vary from new and used athletic shoes to dress shoes and high heels. The twins stored them in their apartment and Blessed Sacrament Catholic Church until the bounty became too much for the small quarters. Garnet & Gold business owner Guy Moore saw the article and offered to house the donations in the store's warehouse. There, volunteers and employees sort them and place them in clear plastic bags. "It's one of those tangible charities that you can do," Moore said. A container that can be used for shipping the shoes can range from $4,000 to $6,000 when sent from Miami to the designated country. In an effort to help the twins, Moore discovered there was a local couple who sent off shoes and clothes to orphans in the Ukraine through their charity, "His Kids, Too!" He also found someone who builds homes in Haiti. As a result of that collaboration, a 20-foot container will be shipped to Tallahassee this week, and the twins won't have to pay the shipping costs to Haiti. "We're hoping to send two to three containers a year," said McKenna, who said they are currently fundraising for the cost of the next container. Teresa Fillmon, who runs the His Kids, Too! charity with her husband, Rich, said they were in need of children's shoes for the charity. "These girls collected tons of shoes. They had this great idea, and they didn't know it was going to be like this," Fillmon said. Although medical school keeps the twins busy, the Share a Pair drive has flourished as a result of their commitment, the local community, and of course, shoes – and plenty of them. shoes ready to be boxed for shipping to Ukraine.